We are excited to announce the first crop of endorsed candidates—from US Senator to Vermont House of Representatives—for the 2018 elections! These 17 candidates were endorsed by a vote of the Rights & Democracy (RAD) Board of Directors to show support for candidates who have championed key legislative issues such as raising the minimum wage, workers’ rights, universal health care, and racial equity, among other top concerns facing Vermont communities and families. 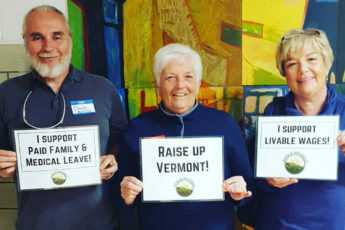 Several of these candidates were backed by RAD in 2016 and not only won their election, but pushed hard for legislation that improves the lives of Vermonters. If you live in the district of one of these candidates—they need your help to win! That means volunteering time to door knock, hold house parties, and raise money. Contact the campaigns directly below, or email Elise Greaves, RAD’s political engagement coordinator to see if RAD is doing any work in these districts. They themselves have been an active RAD member and leader in either a regional group or issue campaign.